Yune makes a frightful decision. 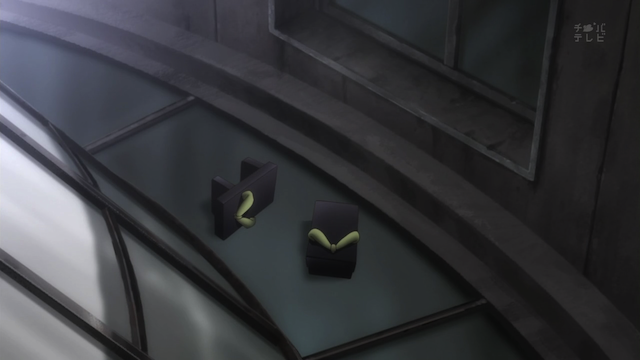 Episode 12 brings Ikoku Meiro no Croisée (Crossings in a foreign labyrinth) to a close. Last week’s episode pointed in two directions for an ending: either exploration of Claude’s relationship with his father, or Yune leaving. This week they managed to go in both directions at once. The result is a surprisingly satisfying conclusion. First a warning: there is a tragic ending, so prepare yourself. Everyone who watches this show knows that Yune just wants to be helpful. 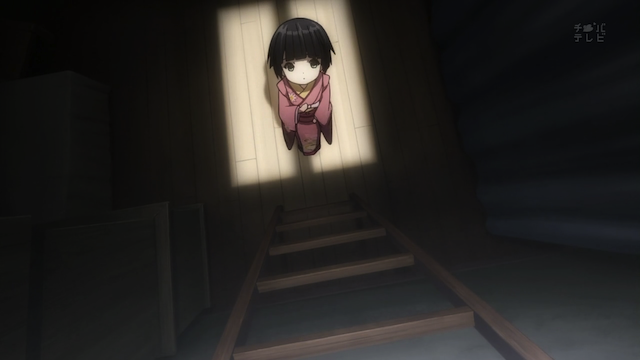 Last episode helped to explain that, by showing us that Yune was sickly as a toddler, and had to be taken care of by her sister, who ended up frail and blind. In a different episode Oscar points out that she feels uncomfortable when she isn’t participating in the work that everyone is doing. As a result Yune tries to be helpful this episode by picking up a small pair of gloves so she can help with the forge without getting burned. Claude reacts violently, because the gloves belonged to his father. He uses vulgar language and tells her to leave at once. This cat was supposed to protect the cheese shop from mice, but he ran away long ago. Yune had been told, by Mr. Yannick, who owns the cheese shop in the Galerie du Roy, that the cat on his sign went missing. 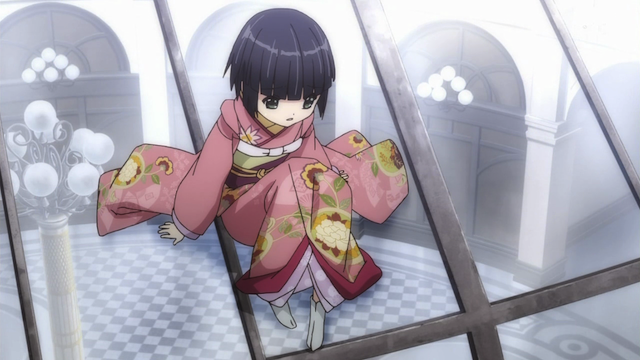 Wishing to be helpful to someone, Yune tries to locate the cat. After having been thrown out of the sign shop, she thinks she hears the cat’s bell, so she goes off in search of it. 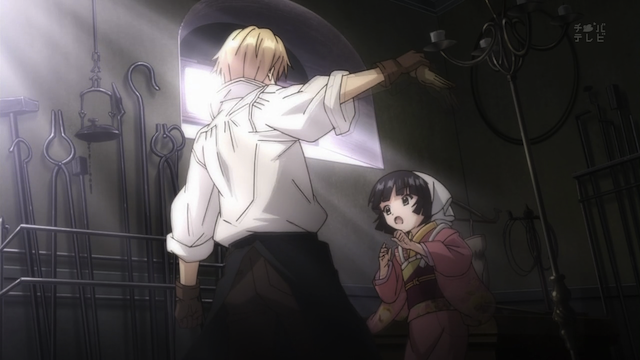 Alan suspects Claude's sharp temper is the cause of Yune's disappearance. Of course, as soon as Claude realizes Yune has left the shop (as he told her to do), he panics and starts searching the Galerie for her. Alan is pretty sharp, and realizes that Claude has been mistreating her. I know some people think that Alice is a tsundere because she can have a sharp tongue, but actually she is not this show’s tsundere. Claude is the true tsundere, because he acts abusively without restraint towards those he cares for, and later wonders why they “got the wrong idea”. In fact when they do get the right idea, that he really does care for them, he gets angry and embarrassed again. 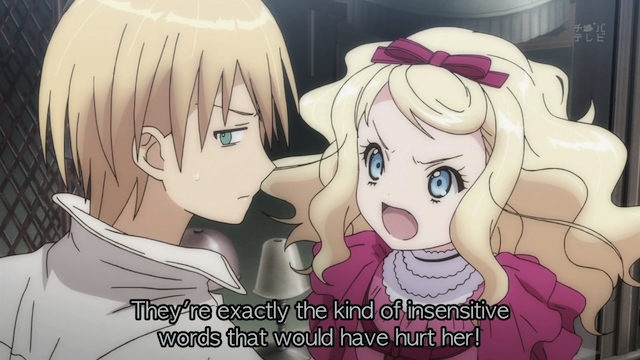 Alice knows damned well that Claude is inclined to make thoughtless remarks that can hurt Yune's feelings. Again, Alice Blanche is NOT a tsundere. She is loud at times, and will berate Claude with the slightest provocation, but she is consistently deredere with Yune and Camille. Unlike the tsundere character type she has absolutely no problem expressing her feelings. Her loudness, selfishness, and abusive comments are not covering up her secret crush. She genuinely dislikes Claude Claudel, and his actions in the first half of this episode show why; Yune was just trying to help and didn’t deserve his thoughtless remarks. He lashes out at her unfairly so that he doesn’t have to admit to the strong feelings he has trapped inside. 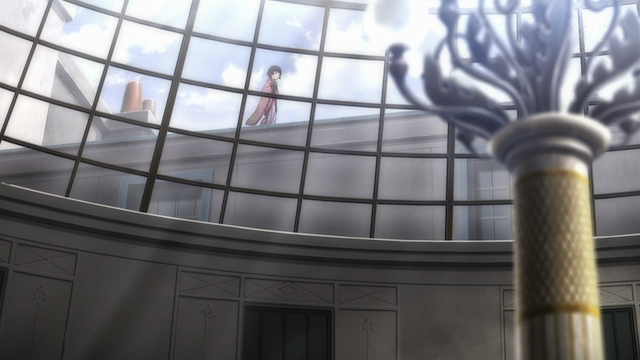 Claude sees Yune on the Galerie rooftop. A suicide attempt? 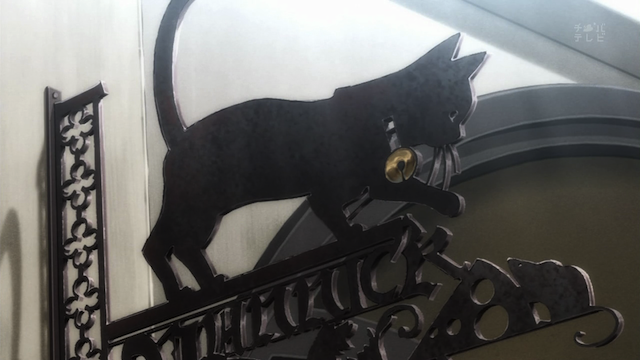 Yune's attempt to return Mr. Yannick's cat leads her to the roof of the Galerie, and this provides very interesting background visuals, and some drama. 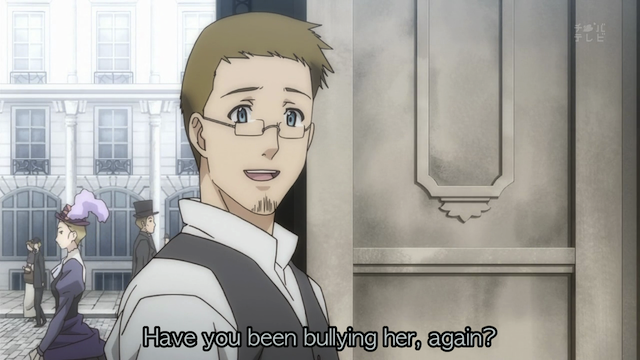 Claude chases Yune up to the roof, and tells her that Mr. Yannick’s cat has been missing for 10 years. There is no point in searching for it. Of course, Claude, being Claude, he does so in the most dispiriting way possible, leading Yune to greater despair of being able to contribute anything. 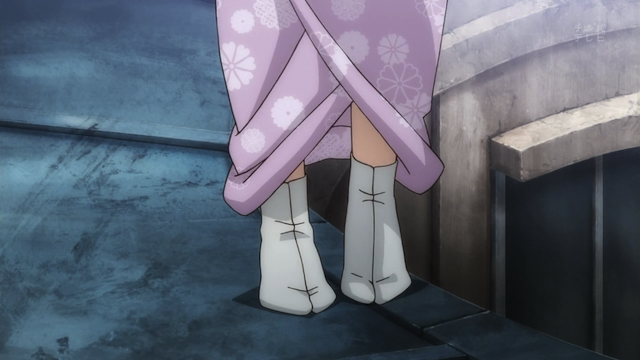 In all honesty, walking around on a sloped rooftop in a kimono is pretty dangerous. 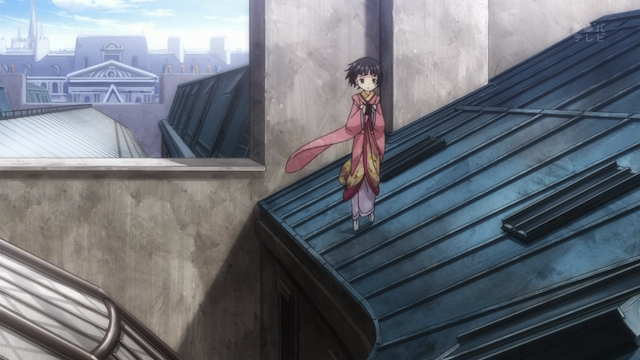 All it takes is a gust of wind to blow tiny little Yune from the roof. She lands on the glass ceiling of the Galerie. To Claude’s horror Yune is blown off the roof. Although she insists she is alright, Claude is still panicking because, should the glass break, she will fall to her death. As it turns out, Claude watched his father die in exactly that way. In his panic to get Yune off the glass, Claude says that everyone is useless, that Yune only takes it personally, because she doesn’t know how useless he and Oscar were when Jean, Claude’s father, was falling. Well it got to a kind of dark place, but it was a bridge of understanding built between them. I was really surprised by this ending. As I said before, I was expecting this episode to focus either on Claude’s issues with his father, or Claude having to deal with Yune’s departure. The way these two issues were threaded together was very interesting. The only problem I have with the ending is that I was disappointed that she lost her shoes. Hearing Yune clop around in wooden sandals was one of the things I looked forward to each week. I really enjoyed this series. I think the characters were fun, and the little vignettes were thought provoking. The artwork was quite lovely, and the music by Kokoya and others was very fitting. I know some people don’t like these atmospheric series, and there are many for whom the thought of a “heart-warming” or “healing” series turns the stomach, but those willing to try it will find an entertaining show. I really liked this series too, and I liked reading your post here–it seems you’ve interpreted the characters much like I have. The author of the series did a good job weaving in bits of background info to help explain why each character acts the way he or she does, and luckily the episodes of this season ended up revealing why Yune, Claude, Alice, and Camille all act the way they do. I just wish for more, because there’s clearly plenty of stuff left unresolved. Claude still has to buy back the kimono that belonged to Yune’s mother, after all! Perhaps I’ll check out the manga some time?? Yes, there are several things that can still be explained, so I too wish for more, but I did really like the series, and think they did a pretty good job of providing a satisfying ending. Honestly I wasn’t expecting the background stories of the characters to be as interesting as they turned out to be. I guess I was expecting the focus to be more on the cultural differences, which gradually gave way to the trapped emotions of Camille, Claude, and Yune. I liked all of the characters, and I am really looking forward to the upcoming special. I tend to enjoy these quieter historical series, so I’m pretty glad that a lot of other folks found something they enjoyed in it as well. I completely did not notice Claude’s tsundere attitude. I don’t feel like he actually is tsundere, more like just a loving brother/father figure – as you said, all his ‘tsun’ remarks towards Yune are out of kindness, so really, he doesn’t have any tsun. That said, Alice doesn’t, either – this show just doesn’t have any. I guess I was surprised at the sudden turn of events into drama these last two episodes, but I can’t say that it wasn’t well executed. The life-building of the previous episodes really helped these last episodes come true. Yes, the turn towards drama was nicely handled. I’m still sorry she lost her shoes in the end, though.